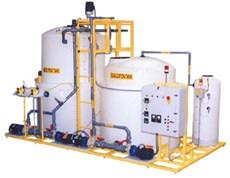 Semi- or Fully-automatic pH Adjust Systems and pH Neutralization Systems equipped with up to 4,000 gallon storage tanks, air or electric mixers, reagent tanks and metering pumps, pH and ORP probes and controllers, electrical control panels with, or without, chart recorder capability, and fully integrated operator access platforms when needed. Our pre-engineered pH Adjust & pH Neutralization Systems offer reliable and affordable pH control of our clients’ wastewater streams and effectively meet the effluent requirements of local municipalities for discharge to sewer. 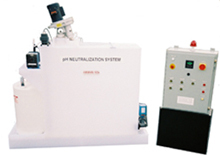 Automate-Tech also offers customized pH Adjust & Neutralization Systems that properly address our clients’ individual compliance requirements. A wide variety of options can be provided depending on the chemical process being treated. Our recommendations take into account the volume of wastewater being generated, the initial pH of the wastewater stream, the desired pH at the point of discharge, and any additional features or options our clients may require. Wastewater flows into the system and fills the collection tank while a pH controller monitors the pH. Should the pH of the wastewater be out of tolerance, reagent pumps and a mixer are then activated until the wastewater is brought into the desired pH range. Once the pH of the wastewater has been adjusted and held for the prescribed time, it is automatically discharged to sewer. © 2004 by Automate-Tech Inc. All rights reserved.